Fr. Kyrillos Ibrahim was born in Cairo, Egypt and raised in California. He holds a B.S. in Accounting from Cal Sate East Bay and an M.A. in Theology from Holy Apostles College and Seminary. Prior to his consecration and ordination, he worked as a CPA in California from 1992 until 2007. He previously served at St. Antonius Church in San Francisco from 1989 until 2001 and St Demiana Church in San Diego from 2001 until 2007. In February 2007, he was ordained as a presbyter by His Grace Bishop Serapion and His Grace Bishop Youssef to serve in the Diocese and assigned initially to St. Demiana Church in San Diego and in 2009 he was assigned to St Marina Church in Irvine where he served until March 2014. 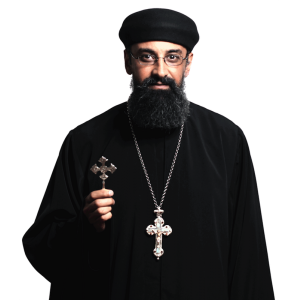 He currently serves at St. Paul American Coptic Orthodox Church.